Linking up to Jen. So glad to hear that her little guy is finally home! Yesterday, Sister Stinky (and Baby Sister) and I went out for our weekly grocery shopping. One of the stores we stop at is right across from the wonderful Daughters of St. Paul. For those of you who don't have one of their bookstores in your area, you should know that one of the best parts of their stores is the fact that they have a chapel that you can visit built right off the store. So, we had to stop in and say hi to Jesus! Even more fortunately, adoration was going on, and so we had a few lovely moments to pray with Jesus and the sisters before we continued our errands. me: Wasn't that nice that adoration was going on? 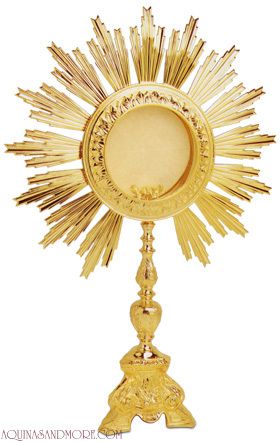 Did you like seeing Jesus in the monstrance? me (realizing she might be getting confused): Oh...monster and monstrance sound similar but they're not. me: No, not that kind of sound alike. Like, the words sound alike. me: No, not a purple monster. Jesus is not a monster. me: I'll just have to show you some pictures of a monstrance when we get home. Never did show her those pictures...but maybe some things are best let go. Baby Sister is healthy! It's official. The doctor says everything looks good. Thanks for your prayers! It was a rough week around these parts, between me having worse nausea that usual (I seriously think there is a link between hyperemesis and weather! ), Sister Stinky having a cold, worrying about Baby Sister's ultrasound...but we made it! In celebration, I browsed some thrift stores alone this morning, and guess what I found (among other things)...an icon of the Sacred Heart and mini chalices! Mini gold chalices for a dollar each people!!! Do you have any idea how long I've looked for those. I'm not ready to work on Sister Stinky and Baby Sister's Mass kit, and I'm thinking that their Montessori space will have to be part atrium. Speaking of rough weeks...another short nap from the little one today. Ahhhh...more to say but limited time. The Abbot has been referring to her as a "Lumpus" when she's been waking up cranky from her naps this week. (And...well...always.) Evidently, she just yelled at the Abbot as he came in and told him, "Not Lumpus! Baby!" Hahaha, "Jesus the purple monster." And, ohh, icons! Where do you find all this awesome stuff? Random yard sales, or church sales? I need to go shopping with you! I found that icon at a St. Vincent de Paul thrift store but I've found icons at other thrift stores, too...probably because we live in a city nicknamed "The Rome of the West" for its Catholicity? Seriously doubt most cities have so much Catholic stuff in their thrift stores! It's ridiculous in the best of ways. I also like rummage sales hosted by Catholic churches (or any churches, but Catholic churches have the cool Catholic stuff). You get to support a parish and get some cool stuff!